Major General William Alexander was an American who claimed the Earldom of Stirling. His claim was eventually rejected by the House of Lords. The Alexander family came from a Scotch-Irish branch of the family descended from the 1st Earl of Stirling Sir William Alexander through his son Lord John Alexander who married Agnes Graham daughter of Robert Graham of Gartmore. Lord John (b. 1605) eventually moved to America due to the overthrow of the Monarchy. Originally I thought that his son the Honourable John Alexander (b.1625) was called John of Antrim. However it would seem that there were two cousins one the Hon. John Alexander and the other Captain John Alexander. The Hon. John and Captain John lived in Antrim before they fled to France. The Alexander family descended from John of Antrim who was probably Captain John also later lived at Temple Patrick Antrim Ireland after their return from America. Captain John Alexander was the son of Andrew Alexander a nephew of the 1st Lord Stirling who grew up with Hon. John Alexander. Andrew Alexanders father had died as a young man and Andrew was brought up by his uncle the 1st Earl of Stirling. Sir William Alexander the 1st Earl of Stirling was made the Ruler of Novo Scotia by King James I and confirmed by King Charles I. His son Lord William Alexander led some settlers to Novo Scotia during the 1620's and 1630's. In reading one of the articles in the 'William and Mary' journal [about the Alexander family] one sees a confusion in the genealogy of the Alexander family. The American General William Alexander knew that he descended from a John Alexander. Which John Alexander they weren't sure and decided on John an uncle of the 1st Earl. This of course was impossible. In fact he descended from Hon. John Alexander the brother of the 1st Earl. Along with Lord John Alexander and his family went the grandson of Hon John Alexander (brother of the 1st Earl Stirling), Captain JohnAlexander who left Britian in 1641 and then eventually moved to Virginia. As supporters of the Stuart monarchy these were years in which the family suffered great losses. Lord John with his son and his cousin's son went to America for a time and died there (in 1667). Two of Captain John Alexander's sons left descendants there. His four sons were Alexander, John, Robert and Philip. These sons are often mistaken for those of the Hon. John Alexander (1624-1663) the son of Lord John Alexander. Lord John's grandson John ended up settling in Antrim in Ireland after spending time in Europe on behalf of the Stuart cause while his two brothers remained in Virginia. John Alexander of Antrim's brother Alexander Alexander (b.1650) also returned to Europe and was the ancestor of Major General William Alexander. It would seem that the Hon. John Alexander did not leave any male line descendants. In 1739 when Henry Alexander the 5th Earl of Stirling died the true heir to the Earldom according to one opinion was Alexander's grandson James Alexander of New York. James like his father David Alexander were staunch Jacobites and James fled to America after the defeat of the Stuart Rebellion in 1715. Nevertheless Major General William Alexander his son claimed to be the 6th Earl of Stirling and was recognised as such by many and was known as Lord Stirling in America. It was believed that the descendants of Lord John Alexander went to America to Virginia. It seems that the descendants of another John Alexander (John of Eredy) of Donegal Ireland who also went to America were confused with the descendants of Captain John Alexander's descendants. Due to the troubles of Charles I and the later Jacobite cause, much secrecy and confusion resulted in order to protect the family. Lord John fled to France on the overthrow of the Monarchy and King Louis (through the intercession of Queen Henrietta Maria of England) granted them permission to return to the Alexander's secret Estate in Novo Scotia (at New Ross) now under French rule. However they were forced to leave their Estate and hidden life when Cromwell's supporters in the American colonies attacked Novo Scotia in 1656. They then moved to Virginia which was a colony with more Royalist sympathies. Captain John Alexander's two eldest sons left America and returned to Europe and Alexander became the ancestor of Major General William Alexander the 6th Earl of Stirling. It seems that Lord John's Parliamentary protector Sir John McKenzie faked Lord John's death and helped him to escape to France or Ireland. Alexander, John, Robert and Philip were born in the Nova Scotia hideaway which was later called New Ross. Lady Agnes was the mother of Hon. Janet and Hon. John Alexander. It would seem that after Lord John escaped from Scotland in 1641 he went with his son John to visit his mother at Mount Alexander in Ireland at the home of her daughter Lady Montgomery. Later John and his son John as well as other members of the family fled to France and then to Novo Scotia as mentioned above. In 1656 they went to Virginia and in 1659 they bought an Estate and called it Caledon after their Province of Caledonia where they were in Novo Scotia. Lord John died in 1667 and his son Hon. John in 1663. Captain John Alexander died in 1677. Captain John's sons Robert and Philip remained in America while John and Alexander returned to Europe. Their second property in Virginia which he left to his son Philip was called Alexandria after the Province of Alexandria in Canada. The names of these two properties demonstrates clearly that these were of the family of the Earl of Stirling. The town built on Alexandria in 1749 retained the name of the property in honour of Philip Alexander and his family. Philip's brother John Alexander (b.1648 d.1712) was the great-grandfather of James Alexander 1st Earl of Caledon (son of Nathaniel Alexander). 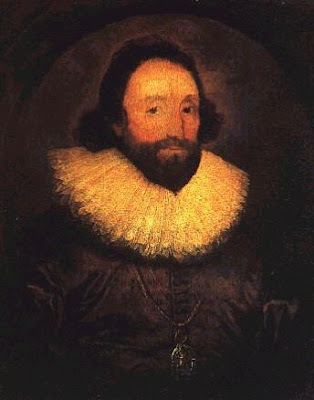 John Alexander's connection to the 1st Earl of Stirling was concealed by deliberately confusing him with John Alexander son of Captain Andrew Alexander due to the political implications. Captain Andrew Alexander was his maternal uncle or grandfather not his father. Even more confusion insured when Alexander Humphreys claimed his ancestor was John of Antrim and through his mother Hannah Alexander claimed the Earldom of Stirling. Others who do not accept his claims believe his ancestor was James Alexander of another branch of the Alexander family. Alexander Humpreys claimed that the wife of John of Antrim was called Mary Hamilton. However it was Robert Alexander son of the 1st Earl that married Mary Hamilton according to other sources. They lived in County Tyrone where his tombstone bears the arms of the Earls of Stirling. He has been confused with another Robert Alexander (of Boghall) who married Mary Hamilton's sister Marion. It does seem that members of the Alexander family lived in Antrim Ireland and deliberately hid themselves among the other Alexander families. However even if Alexander Humphreys claims about his family were true he would still not have been the senior heir of the Earldom of Stirling even if female descent was allowed. General William Alexander only had the traditions and stories he received from his father James and then had to find the documented connection with the 1st Earl of Stirling. Unfortunately his researchers were trying to connect him with the wrong branch of the family as it was assumed that the 1st Earl and his brothers had no more male descendants. There was also a vested interest in Britain to discredit his claim due to the whole issues of the rights to Novo Scotia. However he was supported by the leading Scottish nobles such as the Earl of Bute and the Earl of Argyle and many others including the Jacobite banker Henry Drummond. Alexander Alexander (b.1650 New Ross Nova Scotia)had at least four sons William, David, Michael and James (b.1668). William remained in TemplePatrick Ireland but David, Michael and James moved back to Kintyre in Scotland. James married Margaret Dewar in 1700 in Perth Scotland. James Alexander's son James Alexander of Campbelltown (b.1709 Perth Scotland) descendants also went to America to Pennsylvania. He had at least three sons James (b.1733), John (b.1735) and Henry (b.1740) named after his recently deceased relative Henry Alexander 5th Earl of Stirling. James (b.1668)'s son John Alexander (b.1700) (married Ann O'Reilly and is the ancestor of the Bloomer family of Cavan as well as many families named O'Reilly or Riley. Alexander Alexander married Margaret Falconer the daughter of Sir John Falconer and his Dutch Jewish wife Esther Briot. Their son Michael Alexander (b.1672) married Elizabeth Shimoni or Simon who was a granddaughter of Abraham Simon the famous English medallist. These families were all conected with the Mint. Michael was the ancestor of the English Jewish families of Alexander. One of his descendants was Rabbi Michael Solomon Alexander who became the first Anglican Bishop of Jerusalem. Due to the Rabbi's conversion to Christianity his Jewish uncle Alexander Alexander (known also as Sender)changed his surname to Abrahams. Michael Alexander's son William Wolf Alexander (b.1690) was the father of Isaac Alexander (b.1729) the grandfather of Bishop Alexander. Michael Alexander's daughter Rachel Alexander (b.1700)married Rabbi Joseph Raphael. Alexander Alexander and Margaret Falconer's son David Alexander was the ancestor of Sir William Alexander. David married Elizabeth Sinclair and their son James (b.1691 d.1756) and his wife Mary Spratt were the parents of Sir William Alexander Lord Stirling. Who is the real Earl of Stirling? While the Alexander title of Earl Stirling is dormant it would seem that after General William Alexander's death in 1783 that the claim to the de jure title may have passed to James Alexander Bloomer as the nearest male line descendant. James Alexander Bloomer and his son and grandson seem to have used the title in Russia where it was recognised by their fellow Russian Irish nobility. After their return from Russia they ceased to claim or use the title Earl of Stirling (or Earl Alexander) or the titles gained through the Orurk and Lusignan family of Prince of Galilee and Count of Bethlehem. However Countess Henrietta (nee Orurk) used the courtesy title of Lady Henrietta until her death in 1837. Lady Henrietta became close friends with Lady Caledon and Lady Alexander. She discovered a family secret that the Alexander Baronets of Alexander and the Earls of Caledon were also descendants of the Earl of Stirling but had agreed to confuse their genealogy and give up any claims to Nova Scotia in exchange for the title of Earl Caledon (which was named in honour of Caledon in Novo Scotia). From this time it would seem that the Alexander Bloomer family ceased to claim the title de jure Earl of Stirling and privately recognised the Baronets of Alexander as the true Heads of the Alexander Clan of Stirling. Stockdale's Peerage of England, Scotland and Ireland Volume by Barak Longmate of 1810 also states that the Earls of Caledon are an Irish branch of the family descended from the Earls of Stirling. Both General William Alexander and the Alexander Bloomers descend from Alexander Alexander and the Baronets Alexander and Earls of Caledon from John Alexander his brother. If John Alexander was the eldest then they would indeed be the senior heirs to the de jure title of Earl of Stirling. This would seem to be known by the British government and may explain why they rejected the claims of General William Alexander and his father even though many Scottish nobles recognised his descent from the Earl of Stirling. As it would almost be impossible to prove beyond a doubt who the true heir to the Earldom is today it will remain dormant and be an interesting piece of oral and legendary history. However it would seem that if John Alexander (circa b.1667 d.1747) son of John Alexander (b.1648 d.1712) was indeed 'fostered' by Captain Andrew Alexander then it is his eldest son William Alexander (circa b.1687) and his descendants that are the senior heirs to the Earldom of Stirling rather than Nathaniel and his descendants the Earls of Caledon. When Henry the 5th Earl of Stirling died in 1739 then John Alexander (d.1747) may have been the de jure 6th Earl of Stirling. His son William Alexander would then be the de jure 7th Earl of Stirling. When he died in 1788 then his son Sir William Alexander 1st Baronet Alexander of Belcamp would also have been the de jure 8th Earl of Stirling. His son Sir Robert Alexander the 2nd Baronet would also have been the de jure 9th Earl of Stirling. His two sons were the de jure 10th and 11th Earls of Stirling. When Sir John Wallis the de jure 11th earl died in 1888 the title passed to a relative Sir William Ferdinand Alexander (de jure 12th Earl) a great grandson of the first Baronet Alexander (de jure 8th Earl Stirling). His son Sir Lionel Alexander was possibly the de jure 13th Earl of Stirling and his son Sir Desmond Cable-Alexander 7th Bt the de jure 14th Earl. His son Sir Patrick Cable-Alexander the 8th Baronet Alexander would thus also be the present de jure 15th Earl of Stirling. However this all depends on whether John Alexander was the older brother of Alexander Alexander and if his son John was the foster son rather than the real son of Captain Andrew Alexander (he was John's maternal uncle or grandfather). Andrew was descended from John Alexander of Eredy. If Alexander Humphrey's ancestor the Rev John Alexander (b.1686 d.1743) was the son of John Alexander instead then this line would have died out with the death of his sons John Alexander (died 1765) who was also a minister and Benjamin Alexander (died 1768). The lineage would then return to the descendants of Alexander Alexander. 5. Andrew Alexander of Stirling(b.1605- 1640) married Margaret Graham of Gartmore.